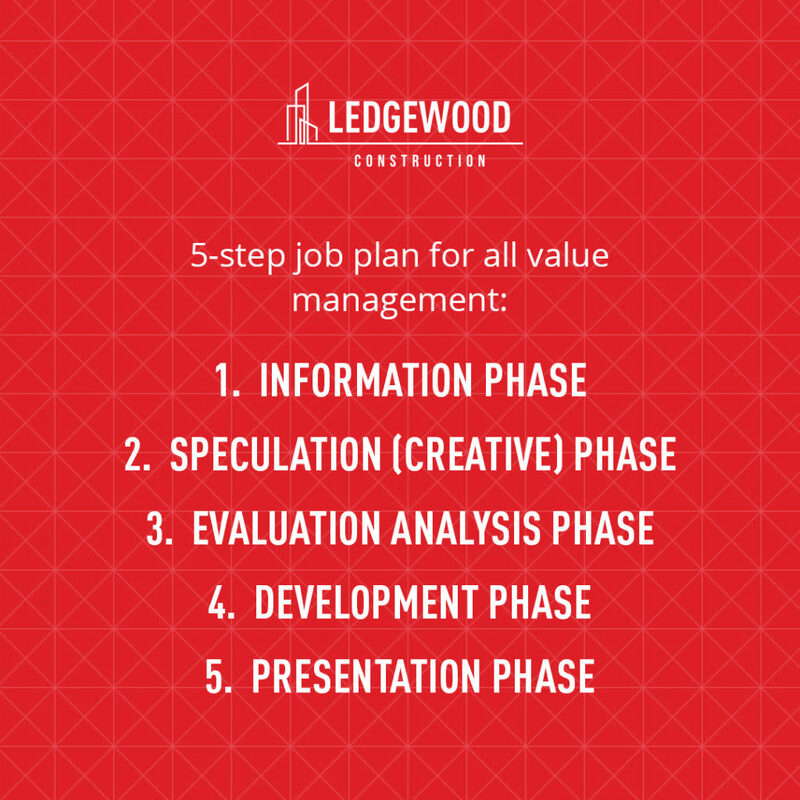 What You Need To Know About Value Management Before Your Next Project Starts. Value Management isn’t just a buzzword. You’ve probably seen it cropping up more and more these days, but it’s not a new idea. It’s a process that, when done right, can add a lot to your project… but when done wrong, it can create delays and failures. Before your next project, get to know what Value Management is, and how it can work for you. What Exactly is Value Management? What many architecture and engineering firms refer to as Value Engineering, we refer to as “Value Management”. 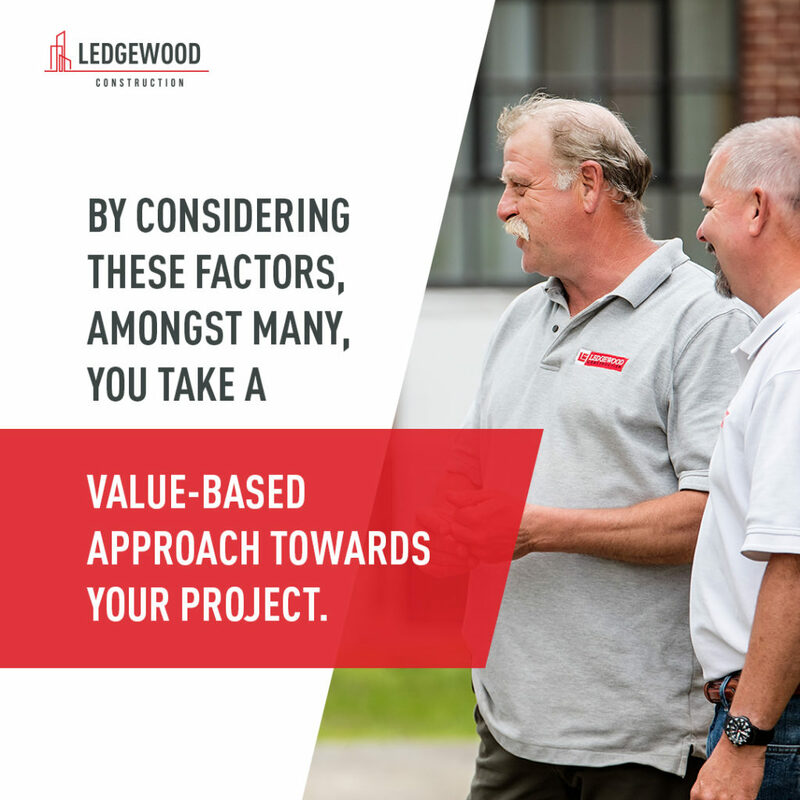 As a construction firm involved with the process from the start, Ledgewood suggests changes early on by looking at products used, sequence of work, constructability, and alternate systems. Value Management is the process of finding alternative materials and processes that remove unwanted costs from projects while keeping or improving the quality of the project. This can mean finding alternative materials to be used that come with a reduced cost, are made with better quality materials, or that have a longer life span. Do they increase or reduce load on the building? Is the lifespan shorter or longer? Can they be purchased at a reduced initial cost? Do they provide better cost savings in the long term, considering replacement cost and maintenance, despite a higher initial purchase cost? Do they perform the same action or function? Does it allow for reduced labor cost during installation? Does it add time to, or remove time from, the expected schedule? While Value Management commonly takes place at the beginning of a job, it can be undertaken at any point. It is most convenient, offers the greatest potential savings, and introduces the fewest potential change orders when it is done before a single shovel hits the job site. However, it’s always better to be late than never. Where Does Value Management Come From? The idea of Value Management stems from the days of World War II, when General Electric’s Lawrence Miles was tasked with developing a methodology that would allow the company to continue manufacturing, despite shortages in materials and necessary finished products. He needed to keep manufacturing running, but the raw materials necessary were not guaranteed to be in supply. He developed a systematic methodology of value analysis and value engineering – later changed to Value Management – that used function-based techniques to solve problems. Using his methods, he was able to discern ways to provide the highest customer acceptance at the lowest cost. What is the Value Management Process? SAVE International – the Society of American Value Engineers – has a great acronym, and is a professional society dedicated to the advancement of Value Management through better understanding of the principles, methods, and concepts involved. The prescribe a five-step job plan for all Value Management. Information Phase: Your construction team defines the Owner’s objectives and key criteria governing the project, as well as their definition of value. They receive a thorough presentation from the design team that helps them to understand the background and decisions that have influenced the design, as well as what key functional issues govern the project. Speculation (Creative) Phase: The construction team brainstorms – but do not judge – ideas that will provide project function while adding value to the project. Evaluation Analysis Phase: The construction team and Client and/or Users of the project define the criteria for evaluation of ideas, then analyze and judge ideas from the creative session. Ideas that are impractical or not worthy of further investigation are discarded, while ideas with potential are moved to the next phase. Development Phase: Ideas are expanded and evolved into workable solutions, with potential recommendations being given brief narratives and analyzed as possible solutions. Presentation Phase: The construction team provides a report that outlines the different recommendations, the rationale behind the development of each proposal, a summary of key cost impacts of each proposal, and a summary of benefits and drawbacks of each potential solution. What Can Value Management Do For Your Next Project? When it’s done right? It can make your next project a massive success. Simplify ordering and planning for materials to arrive on site. Maximize the efficiency of labor. Reduce potential for change orders. Free up portions of the budget to be used in other areas where there is less flexibility. Reduced the overall project cost. Reduce long-term maintenance issues or answer maintenance questions. Add long-term value to the project. What Value Management Is Not. Now that you know what Value Management is, and what it can bring to your project, you also need to learn to recognize what is not Value Management. Value Management is not putting the bottom line first and accepting reduced quality for a reduced cost. Value Management is not altering the project outcome to improve efficiency. Value Management is not changing the desired design or function to reduce cost. Value Management is not a one-sided process, it requires input from design, engineering, construction, and ownership. If the team you’ve hired to value manage your next project is asking to do any of those things, you may want to reconsider working with them. The key is finding a team that isn’t just adopting Value Management as a new idea or concept, but one that has decades of experience in the field. 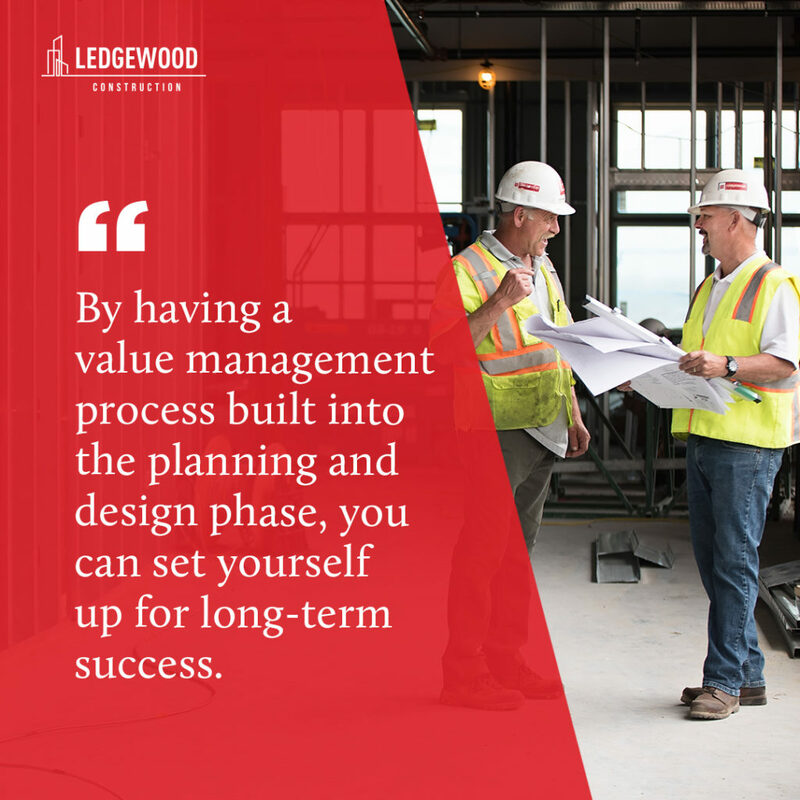 At Ledgewood Construction, we have been Value Managing jobs throughout Maine for decades. We work on projects that are close to home – schools, aging-care facilities, historical building, and more. It is important to us that our projects find every possible way to introduce value, helping to smash budgets and bring more to our communities.